Comey has been flushed out here! 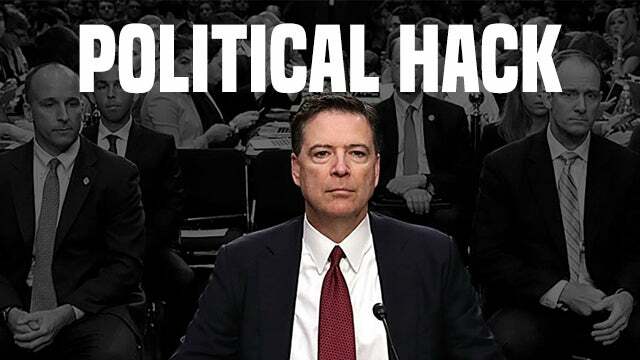 Comey is demonstrating his political bias. And, folks, I have to tell you, this is a big deal. I first heard of James Comey back in the Bush administration, he was deputy AG to John Ashcroft. And Ashcroft had to go to the hospital, had pancreatitis, and Comey was pressed into duty. Ever since then, starting then and up until two years ago, the reputation James Comey had with everybody that I knew was impeccable. Brilliant, reliable, the reporter. Well, let’s go to the audio sound bites. This is Ari Fleischer, the former White House spokesperson for George W. Bush. And he was on Fox Outnumbered Overtime this afternoon, and he was asked to react to the memo. FLEISCHER: James Comey should stand up and do what he likes to do. He should hold a news conference and take this on, answer the questions. To what extent was the FISA court relying on the dossier? Did the FBI inform the FISA court that it was paid by Hillary’s campaign? Why not? James Comey can answer a lot of these questions, and I think it’s appropriate because of the amount of scrutiny now that this is under. It’s not fair to the new FBI director, Mr. Wray, that he has to shoulder all of the burden for all of this, because it happened prior to his watch. RUSH: We don’t need any more Comey press conferences, do we? We need a special counsel. We don’t need a press conference. We need a special counsel. We need a special counsel. And I like Ari Fleischer even though he pronounced it dossier. That’s insider-insider pronunciation style, the dossier. Even at that, Comey should stand up and do what he likes to do, he should hold a news conference, take this on, answer the questions. To what extent was the FISA court relying on the dossier? We already know. Without the dossier, there would not have been anything to show the FISA court. McCabe said so. Andrew McCabe. We also know that McCabe said without the dossier there’s nothing else and that the dossier was added to when it was accompanied by press reports. So James Comey can answer a lot of these questions. I think it’s appropriate because of the amount of scrutiny the FBI and so forth is now under. This is a strange reaction. “That’s it? Dishonest, misleading memo wrecked the House Intel Committee, destroyed trust with intelligence community”? By the way, I have another question. Is this one of the six ways from Sunday that Charles Schumer meant when he threatened Trump? Remember when Chuck You Schumer told Trump the intelligence community could get you six ways from Sunday if you end up on their bad side. Chuck You was Hillary’s partner in the Senate for 12 years, handpicked her successor, Kirsten Gillibrand. Is this what Chuck You meant? Is this one of the six ways from Sunday the intel community can come get you if you end up on their bad side?